Brooks gives us the zombies. He gives us the apocalypse. He’s gives us the premonition of believable horror. An intriguing read for Zack enthusiasts. A prospective consideration for everyone else. Although “World War Z” can hit your heartstrings with baser survival instincts in the tests of human camaraderie, the emotions come between thick political considerations. The story is told through international voices, all of which carry diplomacy. Not just a pulse of government, but explanation after explanation of how world relations effected humanity’s delicate struggle against an aggressive and unforeseen opponent. While my brain was entranced, my heart was stuck against my ribs trying to get involved. On several occasions, the book allowed it. But I was soon brought back into my head. My heart, like the zombies, was occasionally left to freeze during winter. Well written, recommendable, sprinkled with cleverness for clever’s sake. Interesting. I am not a total zombie follower, but I may check this one out. Thanks for the review! It certainly gives a future zombie apocalypse something to stand on, at least in terms of global reaction. 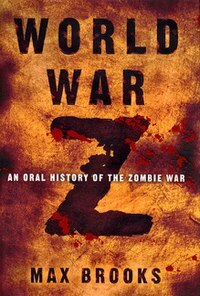 Not once during the read did I think it was anything similar to a robust zombie fan book. Most of the time, it felt all too real.